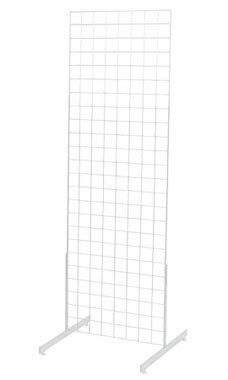 Maximize the space that you have in your store or showroom with this White Standing Grid Screen! Your customers will love seeing your products on this Gridwall Unit, and the attractive White finish of the Grid Unit looks great in any setting you put it in. These Screens are simple to use, and they are portable, which makes selling your merchandise even easier! Measuring 24''W x 6'H, this single grid panel and one set of grid legs, will help to organize your items and products to make your business more efficient. All shelves, brackets and Faceouts are sold separately. You can also tailor your display needs with our wide selection of wire grid brackets, shelves, peg hooks, and other accessories, also sold separately and available here at Store Supply Warehouse. In stock and available for immediate shipment. I ordered these 2' X 6' grids for hanging paintings in an outdoor art exhibit. I received them on time, as promised and assembled one yesterday. They are very sturdy and super easy to assemble placed on sawhorses. I hung a heavy painting high up to test it. These stands are solid and a great value! I did note that in the "directions" section of this site it showed each stand with two lock washers included in the hardware package for each bolt. They arrived (packaged in small bags) with bolts, nuts and one flat washer per bolt instead of the two lock washers in the illustration. No biggie, I'll get some at the hardware store. I still think they are great! This grid is perfect in every way for what I needed. I wish that it wasn't so heavy. Also I ordered the white, and some of the white had been chipped off in a couple of spots, I touched it up and made it work. The standing grid screen is a good tool for displaying merchandise that you need to hang / display. My only concern with the standing grid screen is the leg assembly. The legs are long and become a trip hazard.